Ok, I have been trying to contain this, but I just can't anymore. In less than a week my son, Gage Bailey and I will be on the Dechutes River under the guidance of one its legends Mark Bachmann. Thanks to The Fly Fishing Shop Shop, and Echo Rods im able to fish this legendary river, with my son, in his senior year. The Fly Shop just happens to be based in the town that is named after my family, Welches Oregon, and my son is the last generation in the family bearing the Welch name. Just awesome. I'm sure Mark will never remember this, but when I was a Teen, I saved all year to by a used Maryat Reel that Mark had on the shelf. I put some money down and he assured me that it would be there when I got the rest. It took me a couple months, but true to his word, it was right where he said it would be when I finally made enough money to pay it off. He was always good to us kids. We would visit the shop every time we visited our grandparents. Unlike other shops, he would encourage us to check out the newest rods on the rack. Its cool to think after all these years Im going to be fishing with him, I can't wait. Labels: Dechutes river, fly tying, Spey Fishing Guide, swung fly, The Fly Fishing Shop, Welches Oregon. I started the day off at the annual Two hands at Touvelle event. What a great time, I got to cast the newest and the greatest. I also got to try out a Airflo Rage for the first time...Wow, What a great dry line. 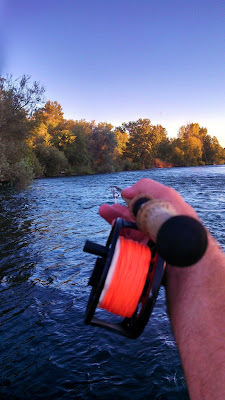 There is something cool about being able to just grab a rod and go cast it, it close to being in steelhead heaven. While there, I met a cool young man named Kellen who was testing rods 3 at a time--my kind of guy. As the gathering wore down I knew that I had to get on the water so I drove to the river, knowing that I was in for a good day. Within three cast I got a tug, and a few later I was hooked up. I was all alone until I noticed a young man make his way to the beach. A few minutes later I noticed he was hooked up and having a hard time beaching the fish by himself so I made my way up river to help him out. Once I got there, I realized it was non-other than Kellen! I tailed the nice hen for him and we both admired the nice fish. With Smile on his face Kellen Said "Everyone says you have to have a bobber and a Nymph to catch steelhead on the Rogue, Why is that?" I laughed, and answered, "I don't know, we didn't even know what a indicator was when I swung flies here as a kid." We both went back to swinging the run--Kellen ended the evening 2 for 2 and I followed 1 for 3, missing grabs in between fish--not bad for a couple of hours. We were the only two people within sight on a Saturday night- just us, the ducks, and steelhead -Have I ever mentioned I love the Upper Rogue in fall. People who know me know that Hatchery Steelhead don't make it past my boat. there are a couple of reasons for this. 1. We don't need them breeding with the Rogues Wild Steelhead. 2. 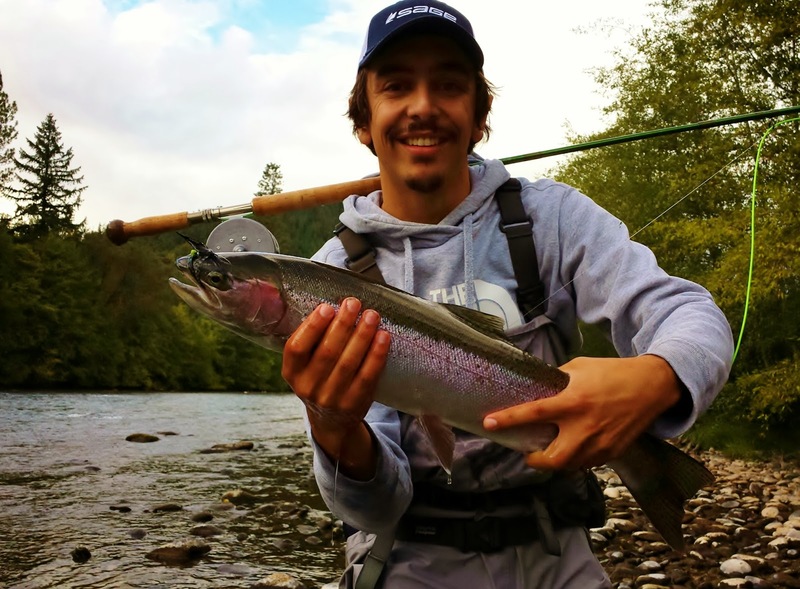 Rogue River Hatchery Steelhead taste so good! Please help the river and keep all hatchery fish. My absolute favorite way to cook a steelhead is on the grill. here is a recipe that will bring everyone to the table. Take a Nice Rogue River Hatchery Steelhead, Fillet it and cut to portions. Mix 1 to 1 ratio of pancake syrup and soy sauce. Pour marinate in a suitable container, add some fresh garlic, add fish meat side down. Let it soak for at least 15 minutes and no more than a hour. Take left over marinade and reduce it to a thick basting sauce. Cook for about 15 minutes or until the steelhead is flaky. A good way to know when its close is to watch the skin, when it shrinks to make the edges of the fillet rounded the fish is about done. Properly cooked, the skin should fall off, but there should be a little moisture left in the meat. pepper to taste and serve with a nice salad, and your choice of beverage. YUM! 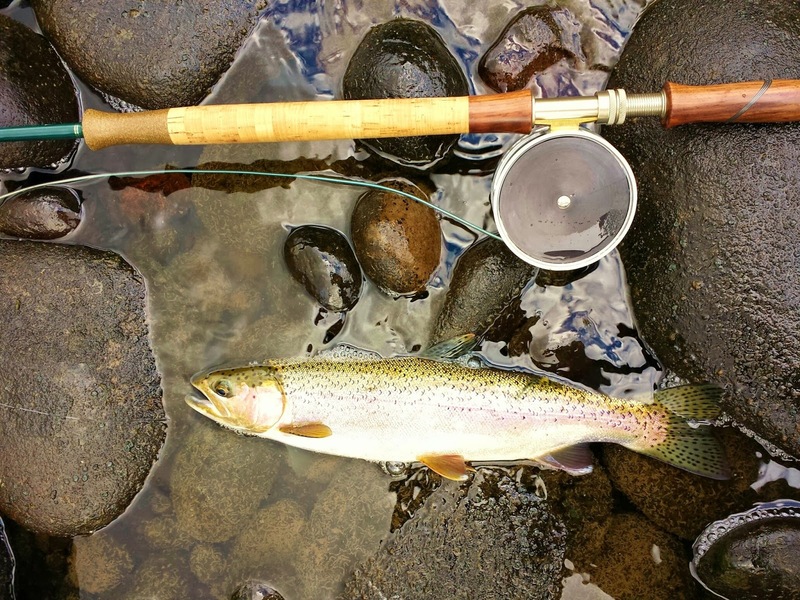 Summer Steelhead On the Rogue River-- How to Catch Fish in the Heat. 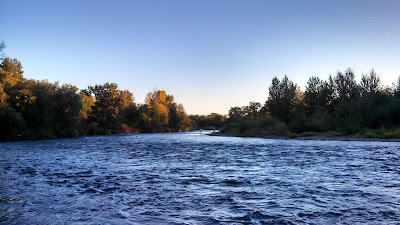 We have had a unseasonably hot weather on the Rogue the last couple of weeks. If you watch the river temp it hovers around 60 deg F, in such weather. I have found that water temp is one of the biggest factors that affects the bite. Until I got the USGS River Flow app for my Android smart phone I didn't realize how much the river temp changed during the day--Now I can Almost time the bite with the info my phone provides, but I have also found some tricks to catch fish in the middle of the day, when water is at its warmest. 1. Fish Deep. You all have been swimming in a lake where the top layer of water is warm, then you dive to find that it cools drastically about 10 foot down. 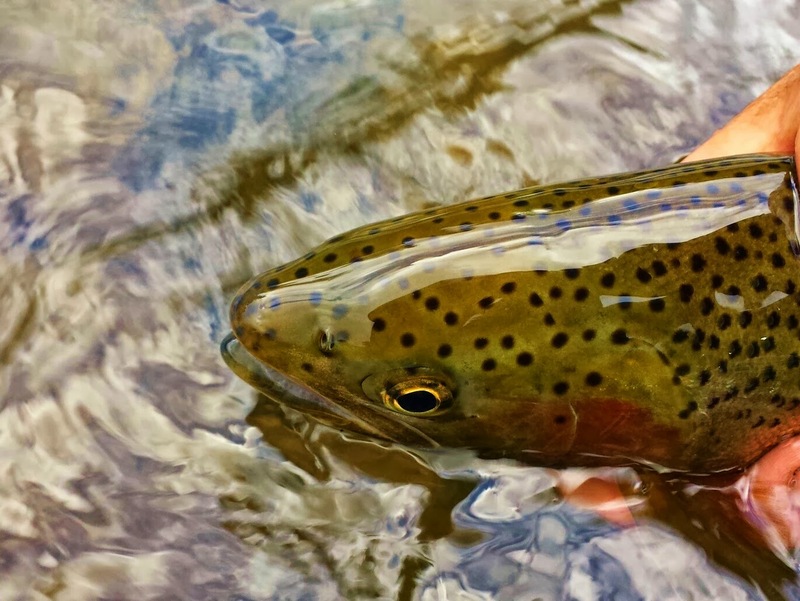 The Rogue Steelhead are masters at finding the, comfort of the right temperature of water. People look at me funny when I pull out the heaver tips and fish the deep stuff in summer, but if your having a hard time in the heat try it . 2. Fish the Shade. This goes without saying, but I see people standing in the mid day sun and fish the same run they fish for winters. The classic steelhead run is 4 to 6 feet of water and is moving at the same speed as you can walk--not in summer if the sun is high and the water is warming, the fish are cold blooded animals, they cant sweat they need to find the cooler areas of the river. 3. Fish Structure, this is much like fishing shade, but what I'm referring to are the ledges and boulders that are under water. I found this theory one day when I was snorkeling the deep holes on the Chetco. If you have ever swam in the Chetco during the summer you know how warm it could get. I snorkeled the river to clean it up after fishing season. One day I saw a lure that was tucked under a basalt ledge. it wasn't Particularly deep so I took a gulp of air and dove to it, once I got to the edge of the ledge I could feel the water cool. Under the ledge it mus have dropped more than 5 degrees. Trout were stacked in that cooler water--steelhead are no different. 4. 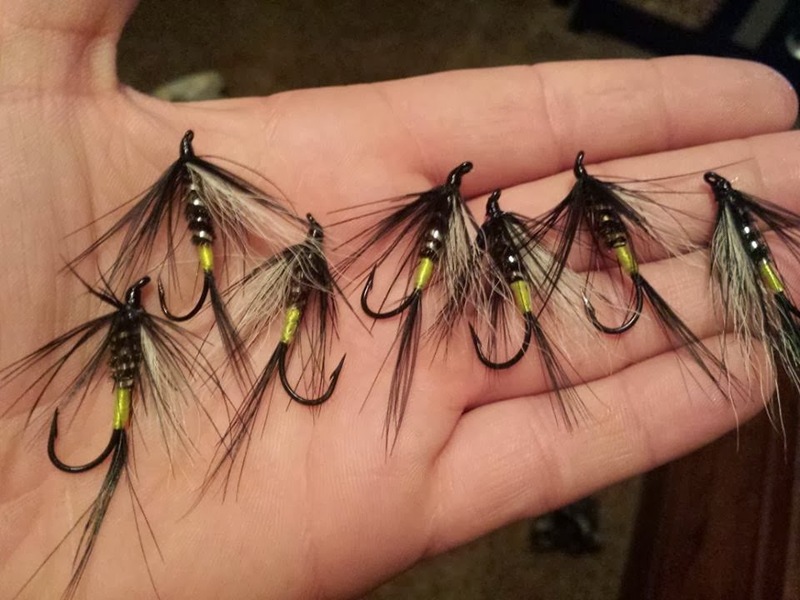 Use Big Dark Flies. Dark because you don't have to worry about off colored water as you would during high spring and winter flows, and big because, much like winter, you have to move their lazy butts. the fish slow down in warm water as much as they do in cold water, you have to play on their predatory instincts. Just look at what your plug pulling friends are using, I guarantee their plugs are bigger, and move more, than most of the flies we fish, yet they catch a ton of fish. Why is that? 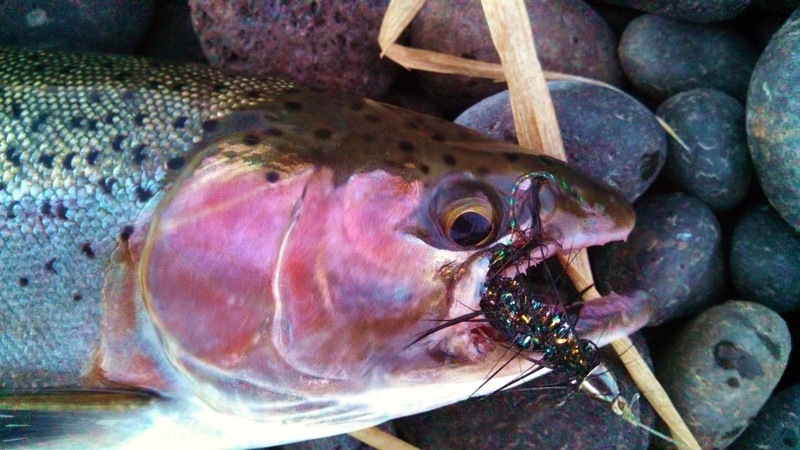 They have tapped into the predatory instinct that all steelhead have to act on, our flies should do the same. These are just sole of the tricks I have came up with over they years. Give them a shot on your water. I have included a couple videos to illustrate the above points. Don't let the heat get you down. Rogue Steelhead have slammed a well swung fly for close to a hundred years. If clients would give it a try they might never go back. I started with a floating Skagit tipped with a clear intermediate poly leader swinging a Silver Hilton. Within a couple cast I got a bump, then another, but it was one of those Rogue Steelhead short strikes you have to get use to if your going to fish this river. I continued to hit the water until I was sure the fish wasn't going show agian, then I switched rigs. 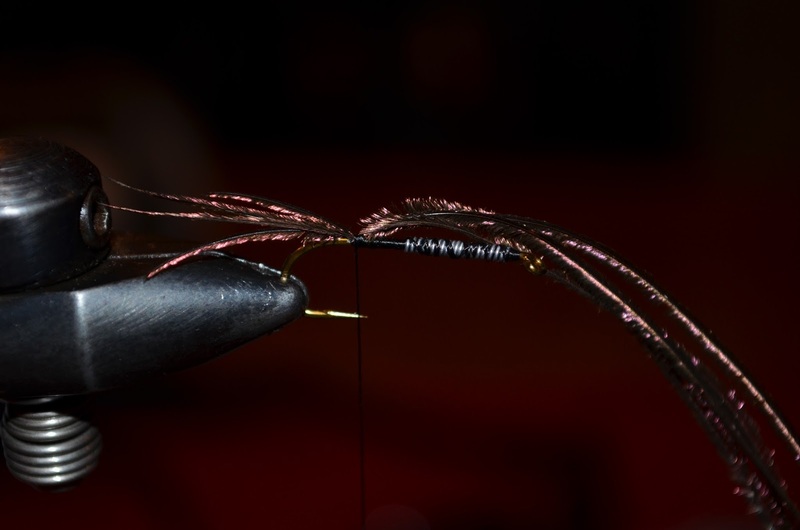 I took off the floater and changed it with a intermediate Skagit. I tipped it with a 10 foot section of T10 and finished it off with a cone head bugger. It only took a couple of passes and SLAM, the rod about came out of my hands. The fish ran, jumped twice then was gone. It was a good size Summer Steelhead. A little disgusted, I halfheartedly swam the fly through the same slot. Just after the second mend my rod doubled again. This fish was smaller but you would have had a hard time convincing him of that. The little guy ripped into the current and made several aerial attacks, but within a few minutes he came to bay. for all of those who are coming to Two Hands @ Tou Velle event. Polly's Black, Pursell's Black, who knows...but it catches fish. 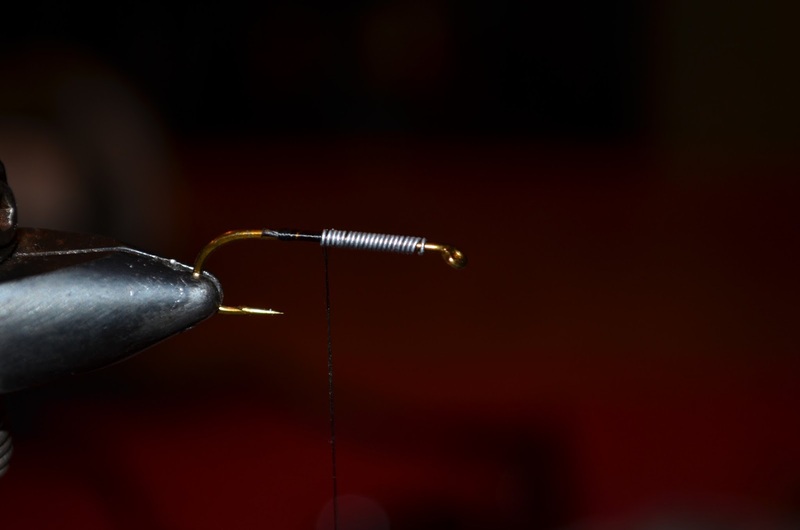 I had been fishing The Williamson for weeks without a single grab, and I was about to give the whole sport up until I met a substitute teacher on a late May school day. His Name was Paul Pursell, and he caught me talking about the days fishing plans with my buddies when I should have been doing my math. He immediately told me to meet him outside in the hall. I thought, "what harsh punishment for a few words," but I didn't protest and I made my way out. He followed right behind me. To my surprise he shut the door, then asked "have you been catching any?" I was flabbergasted, but regained composer quickly, as I always liked to talk fishing. "Naw, They are jumping everywhere, but I cant get them to bite." His eyebrows rose, and he looked over his glasses, "You need to come fishing with me, show up to the green house by the bridge and Ill show you how to do it; now tend to your work." he pointed to my desk. I took him up on that offer and we became good friends. We made a deal that if I cut his grass for the summer he would get me some decent fly gear to use. We both owned up to our bargain and at the end of the summer he gave me a Sage 9' 5wt Reserve Power Rod, it was the latest and the greatest, and I loved it. Paul helped me cast, learn the bugs, and gave me a few pointers on how to fish the Williamson, but he expected me to try to figure out the river for myself, as he knew how that would help my fishing for the rest of my life. After watching me bumble around the river, putting down more fish than I hooked he finally threw me a bone. a little black fly he named after himself, Pursell's Black. He told me, "Cast that fly quartering downstream and let it swing across the current." So the next time I hit the river I followed Mr. Pursell's orders to the tee. That night I landed monster after monster, and wore a perma--grin for a week after. One night Mr. Pursell invited my brother, and I to come to his place to watch the new Gary Borger video with Him and Polly Rosebrough. During the course of the night I mentioned how awesome the Pursell Black had performed. Polly quickly asked me to tell him what it looked like. I told him, then he laughed, "I came up with that pattern." Like a starting pistol, those words started a argument that lasted well into the night. I heard stories of huge fish and how each of them used that pattern before the other: great stories a 12 year old boy to hear from a couple of local legends. I miss those days, fishing seemed simpler and less demanding. 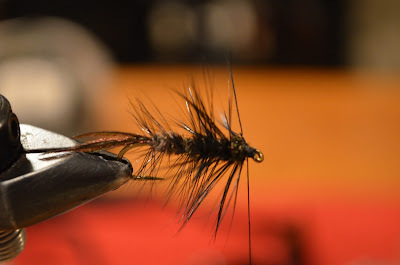 Whenever I tie the Black Fly, (what I ended up calling it so I wouldn't rile the old timers), I remember those times, I hope this pattern brings you as much joy as it has me. I have caught a ton of Williamson River Trout on it and its a great pattern for Rogue River Steelhead as well. Enjoy. 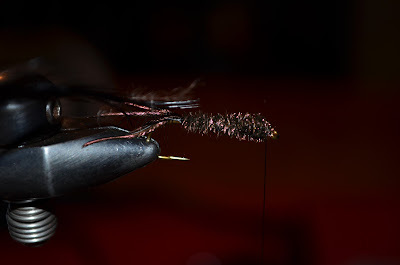 Slightly weight the fly to break surface tension. Add a black, webby, hen hackle tied at the tip. Wrap the peacock to the tip. 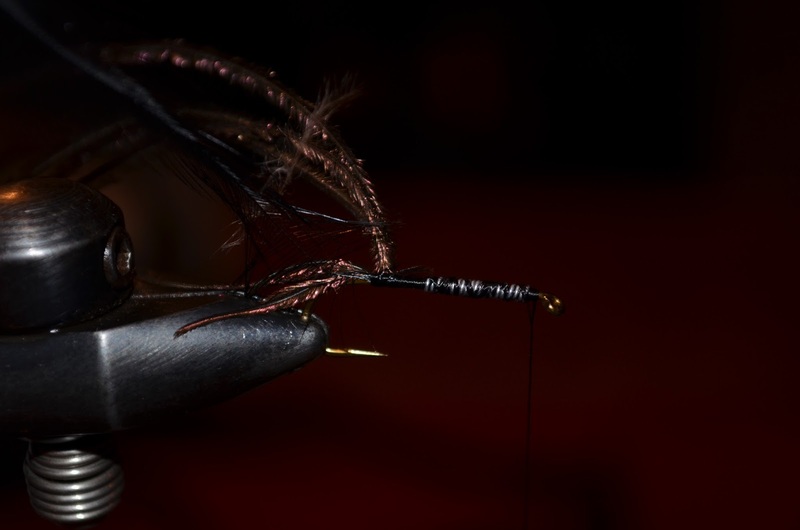 Palmer the Hen Hackle to the eye and tie off. 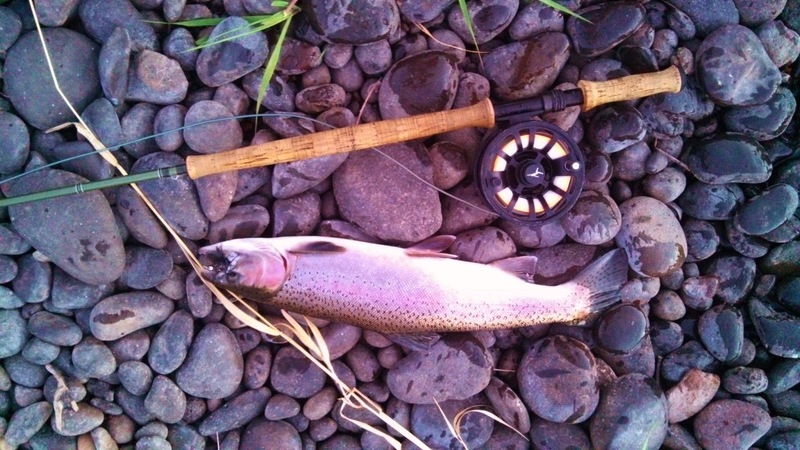 And there you have it a The Fly of Williamson River Legends, swing this puppy and take a step back in time.